While losing a single tooth may not seem like a very big deal, that gap in your teeth can actually lead to greater problems with everyday activities. The bare spot in your tooth-line creates a place where hard foods can jab into sensitive gums causing bleeding and irritation, it can also affect our ability to speak, sing, and of course, there’s always the unsightly gap in our smile that remains. So the obvious question is, what can we do about these singular missing teeth? A full set of dentures may seem too much, but solutions exist! While most of us are familiar with dentures, not as many of us really understand what a dental bridge is. A dental bridge is a method of replacing teeth that uses the neighboring teeth to support it and helps to restore and maintain your faces natural shape. A dental bridge is created by preparing the neighboring teeth and placing crowns on them that are designed to hold the bridge. 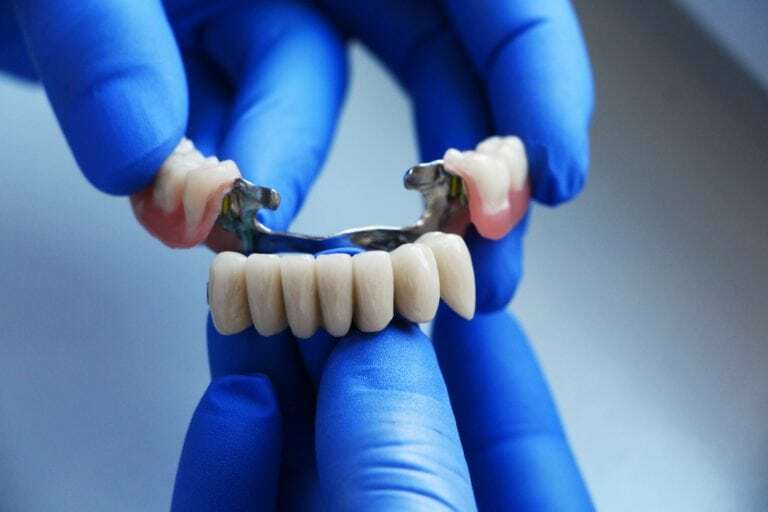 The bridge is comprised of the crowns for the prepared teeth and the pontic, or false tooth, that connects them. Once the teeth and bridge are prepared, they are cemented onto the prepared teeth, creating a new and beautiful smile. The ultimate decision as to whether a bridge is right for you is between you and your dentist, however, there are factors that may indicate this is a solution that is right for your situation. If you have single missing teeth, or two or three teeth that are missing next to each other, bridges are the solution most likely to meet your needs. These teeth are prone to tilting due to the pressures of eating, as well as possibly drifting out of position. When teeth drift out of position they become more vulnerable to gum disease and decay due to being more difficult to clean. Further, the gaps created by these missing teeth can lead to your jawbone shrinking or changing shape in a way that ages you visually. Factors like these often drive people to seek bridges as a way to help maintain their beautiful smile and continue enjoying the foods they love. Will I Need A Dental Implant? Dental implants are sometimes used to create bridges when multiple teeth are missing. By inserting titanium mounting points into the jawbone the dentist creates a foundation on which a full bridge can be placed, resulting in a beautiful and functional smile that will protect your jaw. Only your dentist can determine if a dental implant is going to be a viable part of your bridge procedure. If you have any questions about dental implants or bridges and want to know if they’re right for your oral health situation, contact a dentist like Dr. Scott Simpson at Appletree Dentistry. They’ve been helping patients retain their youthful appearance, restoring confidence and the ability to enjoy their favorite foods by using dental implants for years. The confidence and freedom that comes with a stunning and functional smile cannot be understated, call now!